(APN) ATLANTA — Twelve members of Moral Monday GA were arrested on Monday, March 02, 2015, when a crowd blocked a flight of stairs inside the State Capitol in protest of Gov. Nathan Deal’s continued refusal to expand Medicaid. Those arrested include Kathy Acker, Greg Ames, Adam Cobb, Tim Denson, Bob Goodman, Alan Jenkins, Tim Franzen, Barbara Landay, Adam Lassila, Jean Miller, Gloria Slaughter, and Adam Veale. “Last year, lawmakers failed to expand medicaid and our worst fears have come true,” Tim Franzen, an organizer with the American Friends Service Committee, said in a speech before the crowd. “Hospitals are closing: Four since the failure to expand. Eight are operating on a day-to-day basis, and fifteen are at serious financial risk. And we know that every study shows that anywhere from 1,200 to 3,000 Georgians have died, needlessly died, since Medicaid wasn’t passed,” Franzen said. Hospital closures are affecting rural populations the most. Last year, Georgia Health News reported the state’s rural medical care systems are approaching “Third World” conditions. In Wheeler County, ten percent of the population is unemployed and twenty-three percent are uninsured. When the Lower Oconee Community Hospital closed last year, those people were placed in the precarious position of having to travel thirty miles to the nearest hospital. With Medicaid expansion, the hospital could have stayed open because many of the area residents would qualify for coverage and become paying patients. Health Affairs, a journal of health policy and research, published a report last year showing that over 600,000 Georgians would be eligible for coverage if the Governor were to expand Medicaid. The report estimated that Medicaid expansion would prevent as many as 1,176 deaths. Gov. Deal has cited the costs of Medicaid expansion as a reason for rejecting it. However, under the Affordable Care Act, the federal government would cover one hundred percent of the cost of Medicaid expansion for three years. After that, the state would pay ten percent and the government would cover the remaining ninety percent. According to the Georgia Budget and Policy Institute (GBPI), that amounts to 33 billion in federal dollars, while the state would only have to kick in 353 million dollars, over ten years. GBPI estimates the new spending would stimulate more than 65 billion dollars in economic activity and would help create more than 56,000 new jobs. 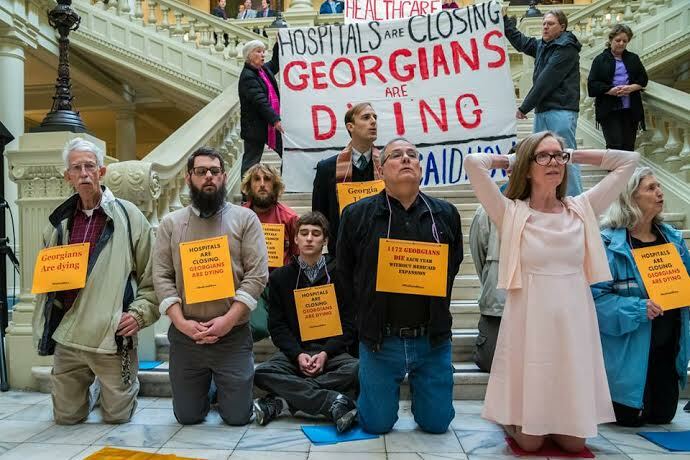 Medicaid expansion has remained at the forefront of Moral Monday GA’s agenda, along with criminal justice reform and other progressive issues. The twelve arrested demonstrators were released from the Fulton County Jail late at night on Monday, March 02. We are working with Health Students Taking Action Today, Emory’s School of Public Health and the network of Emory affiliated hospitals to organize for Medicaid expansion. Other republican governors have signed on, Arkansas and Kentucky state governments have signed on and it is the law in many states. We cannot give you a progress report now but will take telephone calls 11am-5pm ##### (404) 377-9836 ##### This will help rural folk, ex urban folk and urban folk and will help with skills and jobs for areas from Moultrie to Dalton…..Augusta to Albany.